Last week in Step 3, we covered ‘Translating your Website Objectives into Goals & Audiences’. Now lets move on to Step 4. Ensure every one of your Goals has a dollar Value attached (whether it is a literal Ecommerce sale or not). Macro Conversion values should as closely as possible reflect the real revenue value of your sale or lead. Micro Conversion values should be orders of magnitude lower than Macro Conversion values. Eg. A Lead might be worth $100 to you, but a YouTube video view may only be worth $0.01. For Ecommerce businesses, your ecommerce cart should integrate with GA in such a way that actual Transaction and Revenue figures are passed to GA on successful purchase. Do the Ecommerce figures seen in GA agree with those in your Shopping Cart platform? Tip: Use the GA ‘Enhanced eCommerce’ setting in GA to dynamically sync more ecommerce cart data. 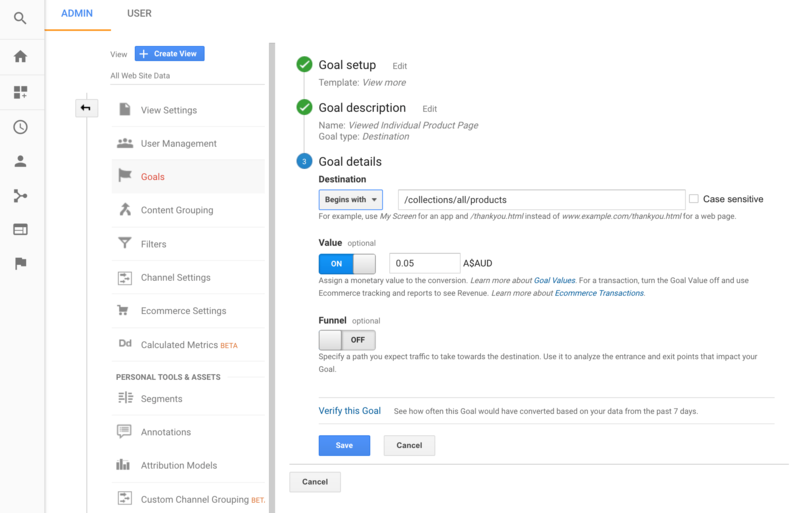 Now that you have defined Values for every Goal, stay tuned for a very common measurement problem that takes seconds to fix in Before you pay for clicks: Step 5.